How to choose a chroma key software? 6.How to choose a chroma key software? 7.What is video bitrate and audio bitrate? Most of us feel excited the moment when we hear about chroma key (green screen). Thinking about that, with this powerful feature, we can do a lot of high simulation movies which may only existed in Hollywood blockbuster makes me happy. If you ever dream of being an actor of a Hollywood movie, chroma key technology will make it come true, creating a new high simulation movie has never be easier. All you need are some chroma key background videos and some green screen or blue screen videos and last but not the least is a chroma key software. However, it is still not so familiar to everyone and nowadays there are kinds of different software boast they have powerful chroma key features. So what is chroma key exactly and is there a best way to choose a chrome key software? You will never really understand chrome key until you practice it. Even though you learn the concept, you will still not really know what it means. Chroma key(green screen) is a feature used for combining videos or pictures by replacing a color in video/picture from another one. To fully understand it, the best way is to download a Chroma key software to have a try first. For a mac user, you can use Apple imovie which is highly recommended or adobe premiere, wondershare video editor for mac and final cut pro. If you are a windows pc user, you can use Wondershare Filmora9 (Latest Filmora version 9)or Adobe Premiere, Corel VideoStudio, CyberLink PowerDirector. 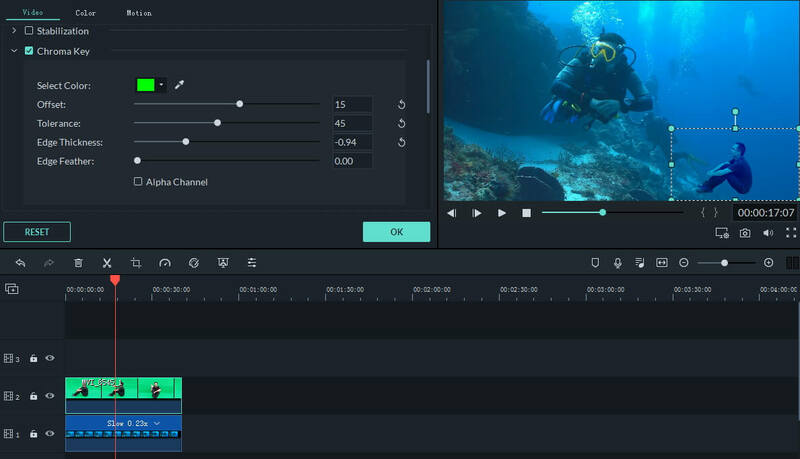 Here we take Filmora9 video editor for example, which is a best video editor software for amateurs and it has the easy to use chrome key feature (green screen feature). In this case, I replaced the background of a green screen video and mix it with a chroma key background video. 3. Double click on the green screen video and choose and check the Chroma Key option under Video tab. 4. Fine Tune the chroma keying settings such as offset, tolerance, edge thickness and edge feather. You can also use the Alpha Channel to get a clean and better chroma keying effect. 5. Then you can also adjust the compositing and blending mode of the two videos and adjust the opacity settings as well. 6. At last, the two videos will be merged into one and you can export it to a new video. When you came to the point to decide which software to choose, there are a lot of things you need to think about. The best free chrome key software for mac is apple imovie, so if you have a mac computer and you are a video editing amateur, you don’t need other software, just use the imvoie, it is completely free. If you don’t have a mac computer, honestly to say there is few free software can produce satisfied green screen videos. Some free software offer similar chroma key feature , but they don’t output as good quality video as paid software. If you cares about quality , I would recommend to find a paid software. It is worthwhile to make good quality video. Nowadays a lot of company offer paid versions, it is really hard to find a true free chroma key software on windows computers. One thing is true that most of them offer a free trial version for their chroma key software. Some software may offer you simple steps to do a chroma key easily while some software offer abundant options to make a 100% adequate Chroma key. It is perfect to make a chroma key 100% adequate, but seeing the abundant option is a big pain for me. As an amateur, a user friendly software is an important factor for me to choose a chroma key software. Some easy to use software likes Apple imovie, Adobe premiere pro, wondershare Filmora9, corel video Studio, cyberlink power director are recommended. If you want other most powerful chroma key softwares, you can use Compositing Images, Adobe after effects, apple shake, final cut pro. I would recommend to start with a basic software first. Having support is always better than no support as long as it won't cost you more money. Do you agree? Make sure you get can right support when you need it any time to do a green screen video. As a beginning user, providing support help us get the software up and running easily. Some big companies may only offer community support and they don’t really offer email or phone support. I would insist email, phone ,online support is necessary. Nowadays some software offers a lot of chroma key resources like chroma key backgrounds, green screen videos. You can buy a software with templates. But if a software doesn't come with these templates it doesn't matter, you can simple shoot some of the special chrome background videos and green screen videos you want. After learning the differences of the chroma key software, you should have already have a Global impression about chroma key software. To decide which one works best for you, I will suggest you synthesize the four differences above and ask yourself , what is the part of a chroma key you value most? As non-professional video amateur, I valued the user friendly software very much and I do need free supports as it will drive me crazy if nowhere to get help when I encounter problems. For the price, it should be as cheap as possible and I don't care about if it comes with any templates because I really want to make special chrome key videos and I really don't like the common resources. As for me, I use Filmora9 video editor on my Mac laptop and Windows PC as well. It has user friendly interface and easy to use chroma key features, one of the most wonderful part is that Filmora9 now features with OS-Cross compatibility, which meand I can edit the Windows Projects on Mac as well. I don't know if I will need other powerful chroma key software in future but currently Filmora9 is best for me and I recommend it to all the non-professional video amateurs like me. Download it to get started with your project now, here’s the free trial version!